It is no argument that Africa is full of enough beautiful landmarks and destinations to leave a first-time traveller spoiled for choice on where to visit but in addition to these quite a number of interesting spots exist. 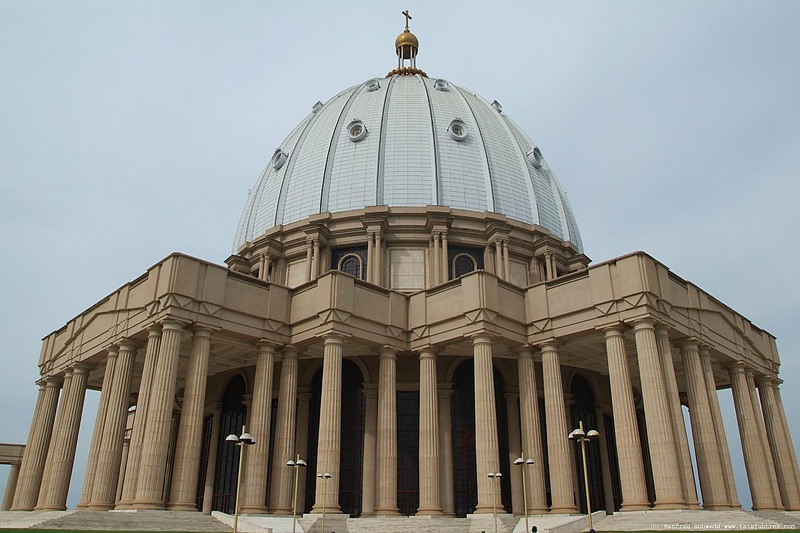 Discover Africa’s largest Catholic church found in the capital city of Yamoussoukro, Ivory Coast. Referred to as The Basilica of Our Lady of Peace, this church is put under the spotlight which is a position it is quite used to, as it is not only a tourist attraction but also one for the religious travelers. It took roughly five years to build The Basilica of Our Lady of Peace and its estimated cost was 300 million dollars. Although, the inspiration behind the design was the St. Peter’s Basilica in the Vatican, it turned out much bigger. After its completion in 1990, it was listed as the largest church in the world by the Guinness Book of World Records. As this takes into note a lot of open space around the Basilica, this position as the largest church in the world is largely debated. Even with its title, it can only hold 18,000 people whereas the St. Peter’s Basilica holds 60,000. The distinct architecture of this basilica is more than enough to make one marvel. Its nave holds up to 7,000 people seated and 11,000 standing adding up to 18,000. The foundation stone was blessed in 1985 which was the year its building commenced, and the basilica was consecrated by Pope John Paul II on its completion. Interestingly, Ivory Coast does not hold many Catholics as only about 33% of the population practice Christianity and much less are Catholics. Managed by the Pallottine Fathers, the basilica is dedicated to Saint Augustine and its design oozes majesty. The gardens are patterned after that of Versailles in France. With two golden statues of the Virgin and the world’s largest stained-glass window, indeed majesty is the word to describe the basilica. This basilica is sure to be on the must-travel list of many pilgrims but for those wanderers, travel and getting to tour the place could easily make a believer out of you.